As Californians, we all know too-well most how dangerous and frightening water scarcity can be. The infamous 2011-2017 California drought may be over, but water conservation will never stop being important–here or anywhere. In fact, water scarcity is quickly becoming a serious problem all over the country. According to the Environmental Protection Agency, 40 states should expect significant water shortages over the next ten years. California is working hard to introduce new statewide water conservation legislation, but we can all help on the local level, too. 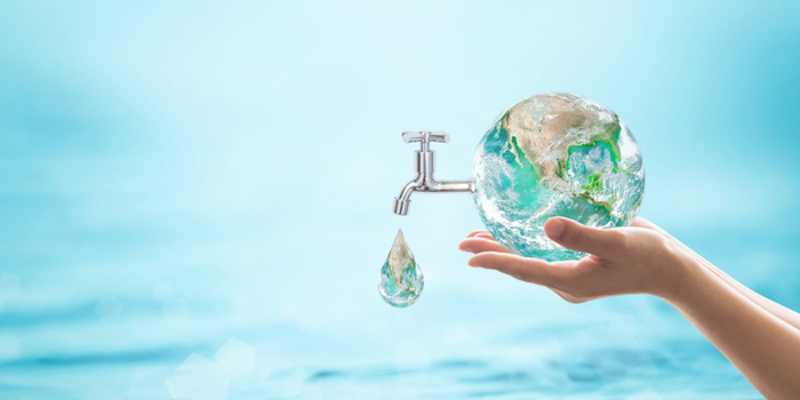 You can even make a significant difference just by striving to conserve water in your own home. Here are 10 surprisingly easy ways you can lower your household’s water usage. You can feel good knowing you’re helping your state conserve water. Plus, you’ll save money at the same time! The EPA can award the WaterSense label to virtually all water-using fixtures and appliances. Look for it when you’re shopping for toilets, showerheads, faucets, sprinkler heads, and more. Switching to WaterSense fixtures is one of the best ways to save water in your home. Turn off the tap when you aren’t actively using it. Brushing your teeth? Washing your hands? Turn off your tap water whenever you’re not actively using it. You can always turn it back on for a second if you need it again. This may sound like a tiny change (and it is! ), but you’d be surprised how much water it saves. Hidden or neglected leaks waste a huge amount of water every year, no matter how tiny they seem. Repair dripping faucets, loose joints, or hairline pipe fractures as soon as you find them. Not only will repairing leaks help you conserve water, but you’ll protect your plumbing, too. An average (non-WaterSense!) shower head could use up to five gallons of water per minute! That means if you cut your shower time by only two minutes, you could save up to ten gallons per day. Showering with purpose will help you save a lot of time, water, and money. Don’t run dishwashers or washing machine until they’re full. Washing just your favorite shirt or running the dishwasher after every meal is tempting, but it’s also wasteful. You should never run your dishwasher or washing machine until you can wash a full load. Both of these appliances use a lot of water, so using them sparingly will really help you save water. We’re not saying you need to stop using your dishwasher or washing machine–just to consider using them less. Consider installing a rain barrel. Rainwater harvesting is great for households that have a lot of plants to care for. Rain barrels are cheap, easy to maintain, and help you save a surprising amount of water. The more you can re-use natural water, the less you’ll have to rely on your tap. This one might seem surprising, but power plants are cooled with hydro-powered technology. Using less electricity means using less water by association. Try to cut out any extraneous electrical use. Switch off fans when you leave a room. Turn off the lights before going out. Use natural daylight to light your home during the day. The more you can reduce, the more you’ll save. Repurpose the water you’re already using. When you think about it, it’s surprisingly easy to “recycle” a lot of the water you use every day. For example: when you drain pasta water, drain it into another bowl. Then, use that water to rinse the fruits and vegetables you’re also preparing at meal time. After you’ve rinsed your fruits, use the water to feed your plants. With a little creativity, you can make a little water go a surprisingly long way. Cover your pool when you’re not using it. Pool covers reduce evaporation and maintain temperature. The Department of Energy reports that pool covers can reduce the need for replacement water by more than 50%. Covering your pool will also reduce re-heating costs and the pool’s chemical consumption. It’s easy, it’s simple, and it saves a lot of water and money. Don’t wash your car yourself. Did you know that washing your car in your driveway could use more than 100 gallons of water? Most commercial car washes, meanwhile, use recirculating systems that help them conserve the water they use much more effectively. Even commercial car washes tend to use a lot of water, however. We recommend washing your car sparingly, and taking it to a commercial washer when you do. As you can see, water conservation requires a little due diligence, but it doesn’t have to be a pain. In fact, learning to conserve water responsibly can also improve your quality of life. For example: a great way to save water at home is to ensure that your plumbing works properly. Good plumbing saves water and makes your life easier and more convenient. Have more questions about how to make your home water efficient? Need some help installing a new fixture or repairing a plumbing problem? No matter what you need, Mike Diamond has what we need to help. Give us a call with any plumbing questions or concerns today. We have the answers.